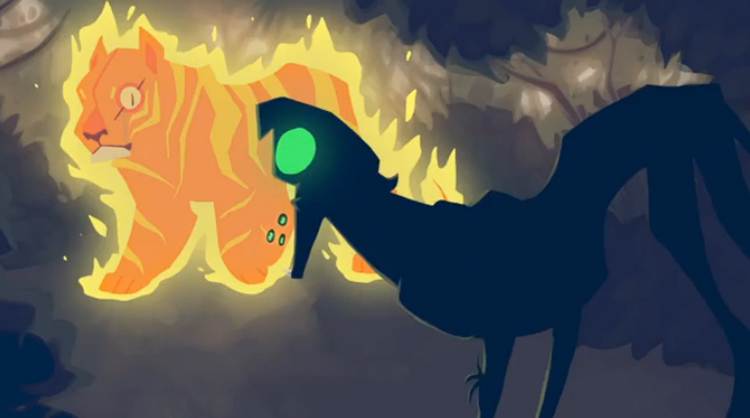 A flaming Fire Tiger takes on a sly Acid Panther in the hunt for a boar in ths animation from Queensland College of Art student Anya McNaughton. A symphony of music and visuals, Fire Tiger vs Acid Panther is a purely visually aesthetic film, designed to compliment a striking drum track created by Andre Bonetti. SYNOPSIS: Fire Tiger is king of the jungle, and eats magic fire berries to aid his hunting. He chases a lazy boar, thinking it will be an easy meal. However, a dangerous enemy, Acid Panther, has targeted the boar for herself. The two enchanted cats tear up the jungle as they balance the task of hunting the same boar and fighting each other off.